The contrasting landscape of the western US states of California (left) and Nevada (right) are highlighted in this Envisat image, acquired on 9 February 2011. In this space wallpaper, the contrasting landscape of the western US states of California (left) and Nevada (right) are highlighted in this Envisat image, acquired on 9 February 2011. 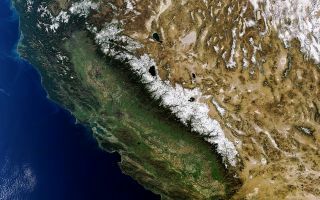 The Sierra Nevada mountain range (snow-capped) runs along California’s eastern edge. Lake Tahoe (visible) is located in the Sierra Nevada on the California–Nevada border. Also visible in the image are the California cities of San Francisco (whitish area on the peninsula surrounding the San Francisco Bay, centre left) and Los Angeles (sprawling grey area, bottom left).